The TFS 600 model is the top of the range, new ULMA TFS Thermoforming line. This is an entirely new machine design concept. 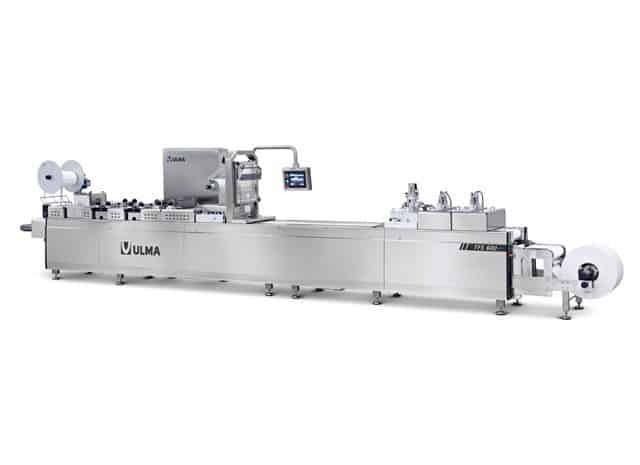 ULMA has redesigned every section of our thermo-forming machine, to surpass the rigorous hygiene and deep cleaning requirements demanded by today’s food packaging industry. We have worked in partnership with the some of the most advanced design, research and innovative centres around the world. This, coupled with our 45 years experience here at ULMA, has allowed us to offer a new line of thermo-forming machines providing superior levels of efficiency, reliability and hygiene. Within our new line of products, the 600 series allows complete adaptability in terms of pack format and production. This is largely due to its modular construction, which provides the ultimate in versatile packaging solutions, along with the main frame design which has a closed profile to provide extraordinary strength and rigidity to the machine.